Contains 147.064 changes from the 10th of February 2015 until the 1st of October 2015 that happened after the 15.3 database lockdown. Inside the .rar file you can find all texts that contain the database changes, plus the instructions text on how to install correctly the files in your game ! • MLS updated with new teams (NYCFC & Orlando City starting in the first season. • All last year's injuries removed and replaced with new. 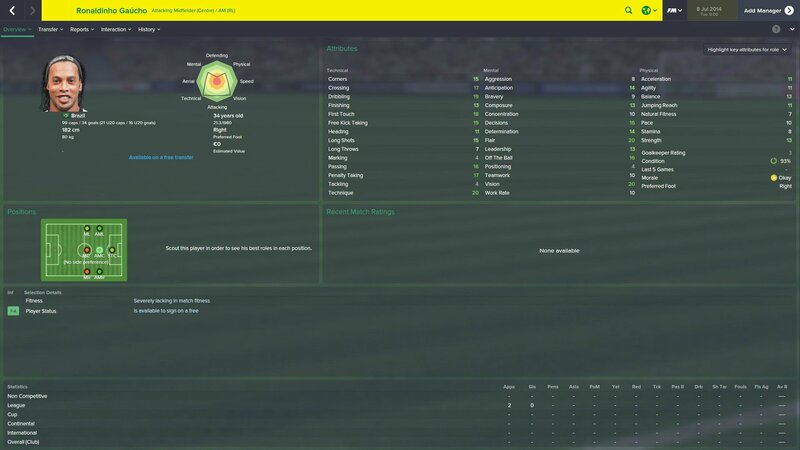 • 2 new wonderkids : Yassin Fortune and Jeff Reine-Adelaide both from Arsenal . • Promotions/Relegations/Cup holders in England until Blue Square North/South , and France until CFA. • Injuries removed from based nations : England , France, Germany , Greece. • New injuries added to players like : Diego Alves , Sergio Asenjo , Claudio Marchisio , Daniel Sturridge. • Yoshinori Muto , Mainz player created. • Uefa coefficients/European places. I need firstly the Champions League Final to be finished. • Injuries in other nations than the 4, I mentioned. • Promotions/Relegations/Cup holders in another nations. Will be completed pack by pack. • Many transfers will be missed, as it's summer and every second a new transfer will come out. • 4 new wonderkids : Toni Trograncic, Federico Valverde, Maximiliano Romero, Caoimhin Kelleher. • Parma's -7 points deduction. • You need the official 15.3 patch to make these files work. • Loans with less than 3 months duration are not included. • Cyprus & Indian Superleague, and Agents files have been removed from now, cause I haven't tested them. Although the Agents file should probably work perfect. If you want the agents file, grab the one from my previous pack. • You need the official 15.3 patch which includes the winter transfers to make this pack work. 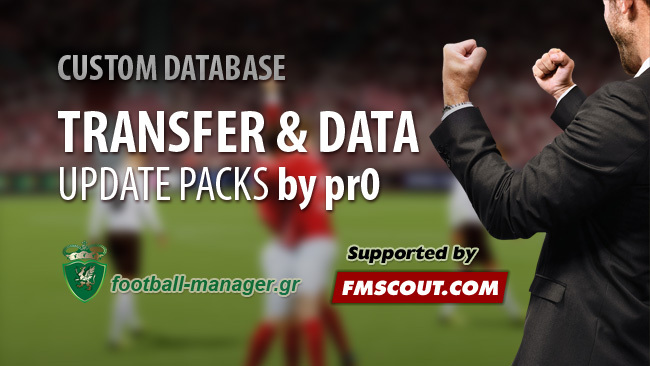 These FM15 Data Packs are created by pr0 on behalf of football-manager.gr community. 168 comments have been posted so far. pr0 did you reconsider making new update? please we all appreciate your amazing work! mariogoetze, there won't be any new release. It was the last pack I released until FM16. blackarmor, they are both added. Luca Valzania - loaned to AC Cesena from Atalanta. These aren´t added. Please check it. 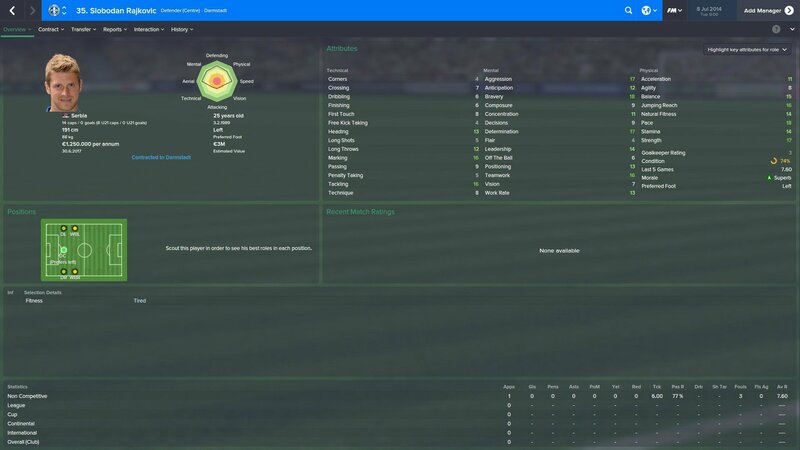 FM15 Transfers & Data Update Pack 3.8 - Final Pack is up !! hey pr0 first of all congrats for the work you put up on this one. I found there is a problem with the greek cup and the rules, it requires to have 7 home grown players in the first 11 and no more than 4 foreigners. AuzanAAgnar, i have updated him, but stars shouldn't confuse you. Players are compared to each other, and if you have for example, Cristiano Ronaldo and Diaby, Ronaldo will have 5 star and Diaby 1 star. This doesnt mean that Diaby is good for Conference Leagues, it's just they have a big difference in their CA. Yiannis Karras, make sure you run only my last files and not older files, either mine or someone else's. welshboy76, do you have the original game? For some reason the files are not showing up in the game. Will you be updating this database? Because I checked that you didn't put Erick Pulgar in Bologna hehe. FM15 Transfers & Data Update Pack 3.7 is up !! • Latest transfers from leagues I have already completed in previous update packs. More focus have been given in Serie A and transfers I have missed in general. • Corrected an issue in Greece with the Greek cup. • Turkish rules are fixed too. Can I change the color of the kits with the Editor and using this database? Because the colors weren't updated hehe. Thanks a lot,one more question,can you increase the CA of Alex Chipciu? toffeeman75, do you use the original game update to 15.3 patch? Szymon, all corrected. About the stadium nothing is so far confirmed 100%. Can you upgrade Yasin Oztekin's CA/PA? He played very well last season and He continues to perform this season. Philippe Mexes have a contract to 30.06.2016 and now he earns 1,5mln euro + taxes (~3mln euro), not 7mln. Alessio Cerci is loan to 30.06.2016, not 2015. I think that Hachim Mastour is too weak on a game. Due to the huge number of transfers happened yesterday and still happening, I decided to postpone the update until the 3rd of Sep. (it will be more accurate that day and more transfers will be included) .